Close any open apps (including VZAccess Manager and BlackBerry Desktop Manager). 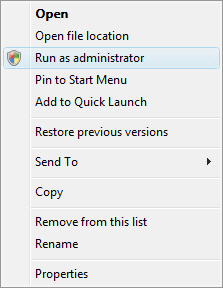 From the Windows desktop right-click the VZAccess Manager icon. If presented with User Account Control (UAC) message, click Continue. If prompted, enter the administrator username/password or contact local IT administrator for additional assistance.